Acemile introduces Theatre Box wireless home cinema speaker | What Hi-Fi? Californian tech company Acemile has taken to Kickstarter to fund the production of the newly-unveiled Theatre Box, a product it describes as the "most compact wireless home theatre speaker". With the initial target of $39,000 reached and surpassed with plenty of time before the campaign is due to end on 29th November, it seems as if Acemile has become the latest crowdfunding success of 2014. 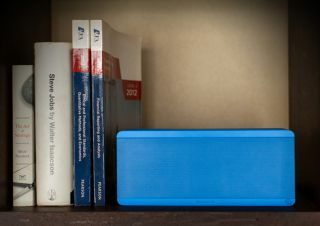 The manufacturer claims the aptX Bluetooth-enabled Theatre Box features "revolutionary 3D audio technology", using sound wave field synthesis that will "render sound waves like continuous layers of bubbles". And according to Acemile, layers of the "bubble" are encoded with a three-dimensional effect – and as that bubble expands and reaches your ear, you'll hear that 3D effect. Acemile says this is termed holophony. The 3D audio claims apart, the Theatre Box houses four 2in full range drivers and a single 3in rear active bass driver under its steel mesh exterior. It delivers 58W of standard power output and 125W of peak output. Theatre Box measures 4.3 x 10.3 x 3.3in (hwd), with a capacitor touch control panel located on the top with controls for volume and skipping content. There's also an auxiliary input if you want a wired connection. You can connect with the Theatre Box from Bluetooth-enabled Android and iOS smartphones and tablets, and there's NFC on board in order to make pairing an easier process. And no apps will be needed to use it. It's believed the Theatre Box will cost $379 when it hits the shelves, but you can still take advantage of early bird offers such as the ability to pledge $69 as a downpayment (total cost $269) or $239 for the Early Discoverer Package.